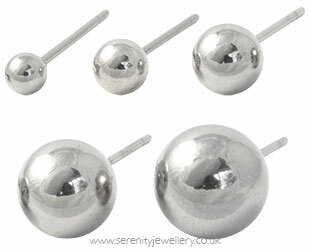 Hypoallergenic 316L surgical steel ball stud earrings with matching butterfly backs. I haven't been able to wear earrings for years as I reacted so badly to the nickel in my jewellery. After abit of internet research I found Serenity Jewellery & I haven't looked back!! It is so nice being able to wear earrings without being in agony, & I have had so many compliments from friends. I wish I had found hypoallergenic earrings years ago. I haven't been able to wear any earrings for years because it hurt really bad and made my ears sore. I have bought 4 pairs of surgical steel earrings and I love them and can wear them all the time without them hurting. 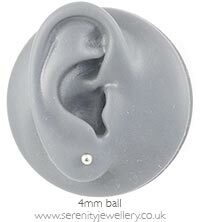 Have a pair of these in my third lobe piercings, size 4 mm, they look great with a combination of other earrings and have been fine after putting them in nearly-healed holes 4 weeks ago. Pretty earrings, my daughter loves them. Great, earrings exactly as described, prompt delivery. Daughter was thrilled with them, thank you. The posts are a really decent length, and the backings don't slide around at all. These are great studs! I haven't traded them out since I put them in several week ago--I'm really happy with them overall!